Do you know William Adams? He was an actual person, and the model for the main character of the film "SHOGUN" which was a great hit in 1970's in the United States. He was a diplomatic adviser for the Shogun 、Ieyasu Tokugawa about 400 years ago. Ieyasu gave Adams the Japanese name "Anjin Miura", and the land Hemi town in Yokosuka today. Adams became a samurai, and lived there with his Japanese wife Yuki and their two children. 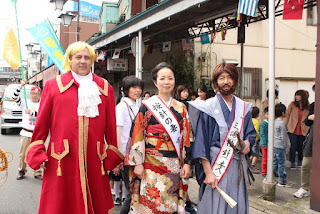 “Sakura Matsuri Parade” will be held in Hemi with some costume parades and the Anjin family. The actor who plays role of Anjin is American who works in Yokosuka naval base. It takes only 10mini by waling from Yokosuka station to Hemi street, and five min from Hemi station. You will enjoy the festival, and We look forward to your visit. Thank you! In case of rain, the parade will be canceled.